For some of us, the winter months usher in an often unwelcome visitor in the form of endless snow. To keep the winter blues at bay, here are some fascinating facts everyone should know about the fluffy stuff. Moisture is, of course, a necessary ingredient of snow. But water is in the atmosphere everywhere as vapor and droplets, and only a fraction of it becomes snow. The catalyst is a condensation nucleus. These nuclei can be anything from particulate air pollution to ash from forest fires or volcanoes to radioactive particles from nuclear explosions. It can also be sea salt, meteor dust from space, soil, sand, or pollen. When the atmosphere is too warm or dry, the dust and water remain separate, the dust creating an atmospheric haze that can sometimes be seen hanging over large cities in the summer. Water droplets do not freeze immediately when the temperature falls to 0 degrees Celsius (32 °F) and can remain in a supercooled state all the way to –40 degrees Celsius (–40 °F). But when the droplets come in contact with the solid surface of a dust particle, they freeze at much higher temperatures, some as high as –6 degrees Celsius (21 °F). Since every dust particle is different, the droplets freeze at different temperatures. As the water droplets freeze, surrounding water vapor condenses on their surface. Because of the V-shaped angle between the oxygen and two hydrogen atoms in each water molecule, the molecules attach to each other in a six-sided shape. Snowflakes therefore first develop as hexagonal prisms about the size of the period in a sentence. The prisms can be slender columns like wooden pencils, flat like a six-sided plate of glass, or anything in between. As more water vapor attaches to it, the columns expand or become needle-like, while the plates develop six arms or branches that sprout branches themselves, eventually forming a flake’s familiar, fern-like shape. A typical snowflake has 180 billion water molecules in it. 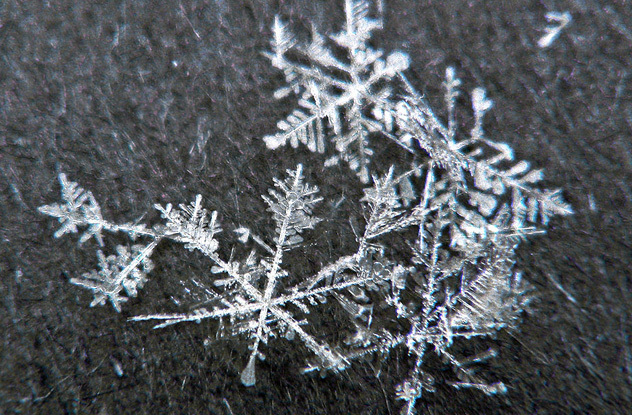 The pattern of each snowflake depends on the available water and the temperatures it’s exposed to. Even snowflakes next to each other develop differently in complexity. This is the reason that virtually no two are alike. Statistically, that famous fact sounds dubious. An average of one septillion (that’s a 1 with 24 zeroes) snowflakes drop from the sky each winter. In all the winters in the past, it’s logical to assume two flakes must have been identical. But the complexity of snowflakes is so great that their variety is nearly infinite. And if we look at them atomically, their complexity grows even more. About 1 in 3,000 hydrogen atoms have a neutron in their nucleus, making them heavy hydrogen. These variations in hydrogen are distributed differently in each snowflake and make the chance of two snowflakes forming identically virtually zero. Despite their variations, snowflakes are uniform in that their molecules take on an orderly lattice structure. And because they are solid, naturally occurring, and inorganic, snow is put in an unexpected classification: minerals. That’s right—snow is in the same class as diamonds, sapphires, and rubies. If you don’t mind keeping your hand in a freezer, they could probably be mounted in a ring. Snowflakes are quite small, and when the atmosphere is uniformly cold and dry, they remain so. Dry snows are the bane of those who love snowball fights, because there’s not enough moisture for the snow to stick together. But when the troposphere is all or partially hovering above freezing, snowflakes melt slightly, forming a wet film on their exteriors. When another flake bumps into it, they stick together, forming a larger flake. The flake then grows exponentially as it collides with still other flakes. If the wind is light, these flakes stay together all the way to the ground, reaching the size of a silver dollar or larger. The largest snowflake on record, according to Guinness, fell on a ranch at Fort Keogh, Montana in January 1887. The rancher measured it at 38 centimeters (15 in) across, about the size of a Frisbee. Snowflakes can also form graupels, a separate type of precipitation. Don’t be surprised if you’ve never heard of them because they’re often mistaken for hail or sleet. Hail is usually associated with thunderstorms, not snowstorms, and requires wind updrafts of 100 kilometers (60 mi) per hour or more. A drop of precipitation freezes, and the updraft sends it skyward, where it encounters more water that forms another layer on it. Hail thus grows until it’s too heavy to be carried upward. It can be as large as a golf ball. Cut open, it will have rings, indicating layers of ice. Another name for sleet is ice pellets, rain that freezes just before it hits the ground. Graupels, on the other hand, start life as a snowflake. As the flake falls, it passes through a cloud with supercooled droplets about 10 millimeters (0.4 in) in diameter. The droplet adheres to the flake and freezes. 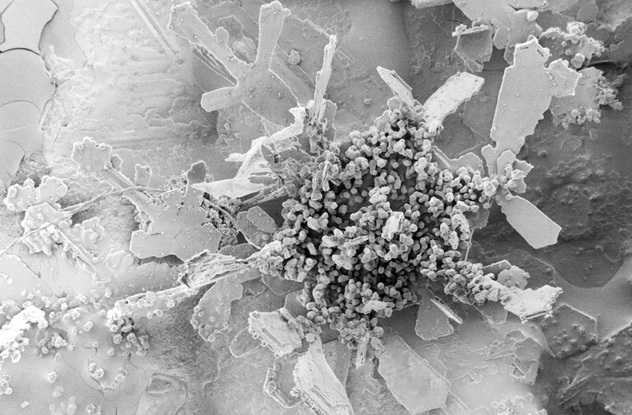 In the image above, the original dendrite snowflake can easily be seen with a big lumpy ball attached to the center. These graupels usually remain small and are much softer than the icy surface of hail. They are tiny snowballs, only fit for snow battles between Jonathan Swift’s Lilliputians. Snow appears white because the flake’s complex structure gives it numerous surfaces to reflect light throughout the color spectrum. What little sunlight the flake absorbs is also done uniformly. Since the spectrum of visible light is white, we see snow as white. In fact, that’s why we see most white substances as white—because of the irregular way in which they scatter light. Without its complex structure, a flake is liquid water or pure ice, which is transparent, not white. Snowflakes also needn’t be white at all. Blue snow is an alternative result of the scattering and absorption of light. The color blue is less easily absorbed than other colors, and if we look at snow from a distance, we may see blue colors among the white. Photosynthetic algae can also tinge the snow red, orange, purple, brown, or green. A common color is red or pink, and it is usually called “watermelon snow” both because of its hue and its sweet taste (although it’s not advisable to eat it). Snow has also been known to fall in different colors, usually due to air pollutants. Orange, oily, smelly snow fell in Siberia in 2007. In a typical year, 105 snowstorms hit the US, and each storm can drop 35 million metric tons (39 million tons) of snow. That’s equivalent to 11,000 Empire State Buildings of fluff falling on our heads annually. Is it any wonder that snowstorms can bring whole cities to a standstill? A 2010 study found that some local economies could take a $300–700 million hit for a one-day shutdown due to a single snowstorm. That’s not counting lost revenue from taxes. Nor does it count snow removal. Missouri spent $1.2 million to dump 18,000 metric tons (20,000 tons) of salt on its roads during one February snowstorm in 2011. Then there are the deaths. Since 1936, snowstorms have caused 200 deaths annually. About 70 percent of those are due to automotive accidents. Another 25 percent are the result of overexertion due to shoveling snow or pushing cars. The remaining 5 percent are due to roof collapse, home fires, carbon monoxide poisoning in stalled cars, or electrocution from downed power lines. That doesn’t even count blizzards, which depend not on snowfall but on a sustained (three hours or more) wind of at least 56 kilometers (35 mi) per hour. Blizzards are not as frequent or deadly as other extreme weather events such as hurricanes or tornadoes, but not all hurricanes or tornadoes take human lives. By contrast, nearly every blizzard results in fatalities. In February 1972, Iran suffered a week-long blizzard where 8 meters (26 ft) of snow covered several villages, killing all their inhabitants. The death toll reached 4,000. By comparison the deadliest tornado in history touched down in Bangladesh in 1989 and took 1,300 lives. Real snow sculpture is beyond the abilities of most of us. The best we aspire to is a trio of giant snowballs atop one another, with a carrot and charcoal briquettes in the proper places to form a frumpy snowperson. As we step back to admire our artistic genius, we often wonder who could have made a better one. Here’s your answer. Guinness gives the nod for the tallest snowman to 37.2-meter (122 ft) “Olympia.” She was named after Maine’s senior senator at the time (Olympia Snowe), and residents of Bethel, Maine spent a month building her in 2008. Her eyelashes were made of skis, her eyes made of giant wreaths, her lips made of red-painted tires, and her arms were made of two 8.2-meter (27 ft) pine trees. For style, she received a 30.5-meter (100 ft) scarf, truck tires for buttons, and a 2-meter (6 ft) pendant. While she may not admit it, Olympia tipped the scales at 6 million kilograms (13 million lb). People have been strapping wood to their feet and sliding down mountains for 4,000 years, but it wasn’t until the mid-1800s that skiing was established as a recreational and sporting event. It was another half century before the first snow machine was patented. In March 1949, Wayne Pierce, Art Hunt, and Dave Richey hooked a garden hose to a paint spray compressor. They demonstrated how water forced through a nozzle would atomize into a mist, allowing it to freeze at higher temperatures. In 1961, Alden Hanson patented a snowmaker that used a fan to shoot the snowflakes farther. In 1975, a University of Wisconsin graduate student discovered an even better nucleating agent: a biodegradable protein that helps water form ice crystals. In other words: dirt. Just as grit does with natural snow, it was the catalyst for water to freeze in warmer weather. 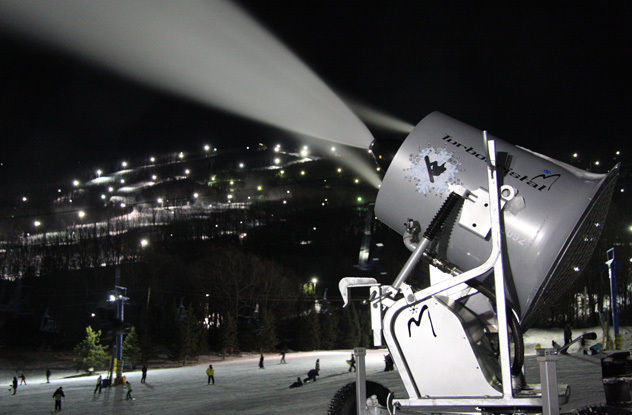 Today, snow machines (“guns”) make snow pretty much the same way Mother Nature makes it. When the 2014 Winter Olympics were held in the beach resort of Sochi, Russia, organizers readied 500 snow machines to make sure there was enough snow. The average February temperature in Sochi is 4.4 degrees Celsius (40 °F). And, just to be sure, the Olympic committee stored 710,000 cubic meters (2.5 million ft³) of snow taken from the Caucasus Mountains the previous winter. In preparation for the 2008 Summer Olympics in Beijing, Chinese scientists claimed that they’d triggered the first man-made snowfall over the Tibetan plateau. They fired cigarette-sized sticks of silver iodide into the clouds in 2007, and 1 centimeter (0.4 in) of snow fell. The lattice structure of silver iodine is similar to water and bonds with it, acting like grit does with natural snow and seeding the water into freezing. China used it again in 2009, hoping to relieve a drought around Beijing. It’s unclear whether cloud seeding works, mostly because it’s hard to demonstrate whether the cloud would have dropped snow anyway. Of course, sometimes you want it to snow indoors. For that you need artificial snow. One of the easiest ways to make it is to add cold water to sodium polyacrylate. This results in crystals that look and feel like real snow. And where can you find sodium polyacrylate? Disposable diapers. That’s right: Every time a baby pees in a diaper, they’re also making warm, yellow snow. Mars has some wild temperature swings. If you stood on the Martian equator, you could slip out of your shoes but would still need a hat. The reason is that the temperature at your feet would be 21 degrees Celsius (70 °F) and at chest level 0 degrees Celsius (32 °F). This is why it could snow on your shoulders but disappear before it tickled your toes. In 2008, the Mars Lander watched a Martian snowfall, which vaporized before it hit the ground. But Martian snow does reach the ground, especially around the poles. 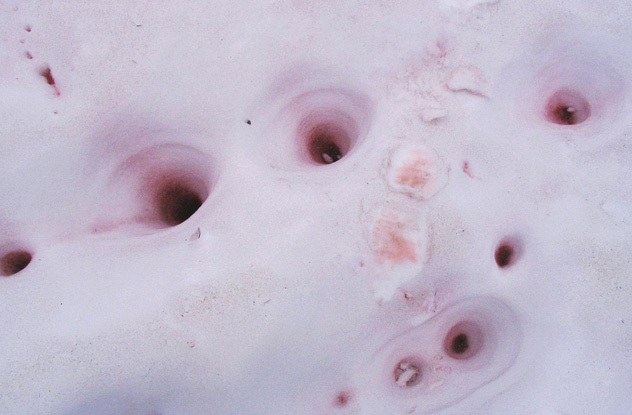 The above photo is of Mars’s North Pole. The snow isn’t water. It’s frozen carbon dioxide. The crystals are microscopic—probably about the size of a red blood cell—and would fall like a mist or a very thin fog. The dry, powdery particles would not pack into a snowball but would be a skier’s dream. 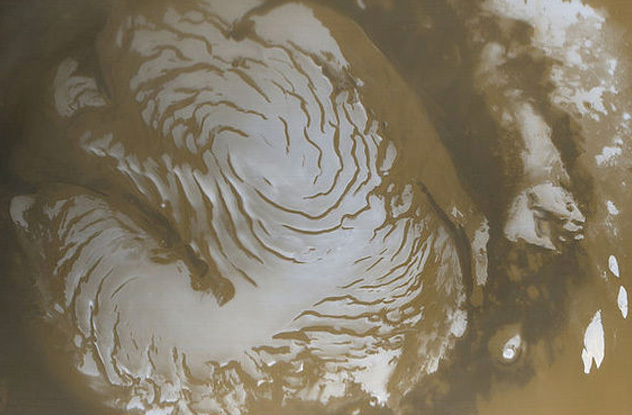 On rare occasions, water-ice does fall on Mars. Snow has also been found on Venus, and it is far more bizarre than Martian flake. It is neither water nor carbon dioxide. Venusian snow is made of metal. Venus’s lowlands are littered with pyrite minerals. Together with crushing atmospheric pressures and temperatures as high as 480 degrees Celsius (894 °F), the minerals vaporize, rising into the carbon dioxide atmosphere. At higher, colder elevations atop the huge Venusian mountains, the metal mist blankets the slopes with bismuth sulfide and lead sulfide, commonly known as bismuthinite and galena. Whether snows actually falls on Venus is unknown, but rain has been observed. Again, the rain is not exactly like a shower on Earth. It’s made of sulfuric acid. The current record for world’s largest snowball fight is held by the inhabitants of Seattle. Anyone who’s lived in the Emerald City knows that it rains there far more than it snows. So when Seattle wanted to sponsor a fundraiser culminating in a record-breaking snowball fight, they had to drive 34 truckloads (74,000 kilograms, or 162,000 lb) of snow from the Cascade Mountains to the Seattle Center right next to the Space Needle. Six thousand tickets to the fight were sold online, and each ticket holder received a wristband. On the designated Snow Day, January 12, 2013, 5,834 ticket holders scanned their wristbands before entering the arena. The arena was roughly divided in half with a few snow forts scattered about. Some participants brought snowball makers. The previous record was held by 5,387 South Koreans who threw more snowballs up in the air than at each other. Seattle would have none of that. At 5:30 PM, 130 Guinness judges ringed the area and gave the signal for the fight to begin. They disqualified anyone who did not throw a snowball in the next 90 seconds. The video shows a massive curtain of snowballs flying. Some participants received welts. At the end of the allotted time, Seattle had set a new record. By the end of the day, $50,000 had been raised for the Boys and Girls Club. The unofficial record for the biggest snowball fight belongs to men long dead. During the Civil War, two Confederate units attacked each other with nothing but snowballs. Two snowstorms—on February 19 and 21, 1863—dropped 43 centimeters (17 in) of snow on Fredericksburg, Virginia, where General Thomas “Stonewall” Jackson’s 2nd Corps was camped for the winter. General Robert Hoke’s brigade had a friendly rivalry with Colonel William Stiles’s 16th Regiment. On the morning of February 25, Hoke’s five North Carolina regiments marched on Stiles’s camp and attacked. Stiles’s Georgians beat them back then marched on Hoke’s camp. The North Carolinians were waiting for them with haversacks filled with snowballs. The melee that followed involved an estimated 10,000 men. Stonewall is said to have watched the fight but did not participate. A few of the Confederates wished he had: They wanted to give the surly general a face-full of snow. If you’re still blue, there’s a place you can go that is so dazzling, it could take the bite out of winter. In January every year, nearly 30 million visitors descend on Harbin, the capital the Heilongjiang Province in northeast China, for the International Ice and Snow Sculpture Festival. The average temperature in Harbin is –17 degrees Celsius (0 °F) and its record lowest temp is –35 degrees Celsius (–31 °F). This makes it ideal for ice and snow sculptors to create magnificent works of art. The festival started in 1963 as an ice lantern garden party. It was shelved for decades during China’s Cultural Revolution, but in 1985, it was revived as annual event. It’s entirely paid for by the Chinese government and lasts about a month, culminating in a day devoted to destroying the sculptures with ice picks. Ice lanterns—hollowed out sculptures with a candle inside—are still a part of the festivities, but the crowd pleasers are the life-sized ice buildings and architecture. 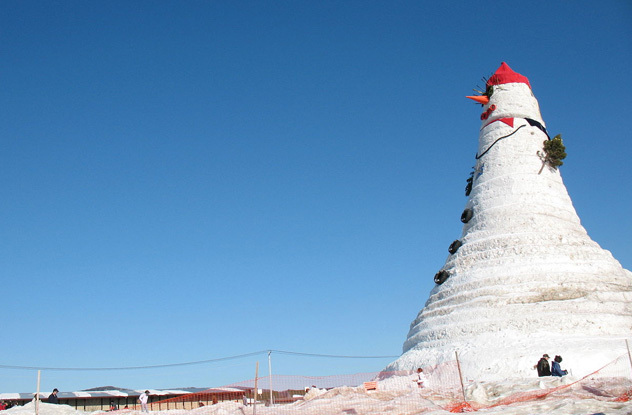 In December 2007, 600 sculptors participated in building the world’s largest snow sculpture to open the 2008 festival. Called “Romantic Feelings,” the sculpture was 35 meters (115 ft) high and 200 meters (656 ft) long. It featured an ice maiden, a cathedral, and a Russian-style church. Steve is the author of 366 Days in Abraham Lincoln’s Presidency: The Private, Political, and Military Decisions of America’s Greatest President and has written articles for KnowledgeNuts.